In my opinion, the worst thing in a beauty routine is body moisturising. I don't have the patience to stand around feeling all sticky, waiting for the creams to sink in. 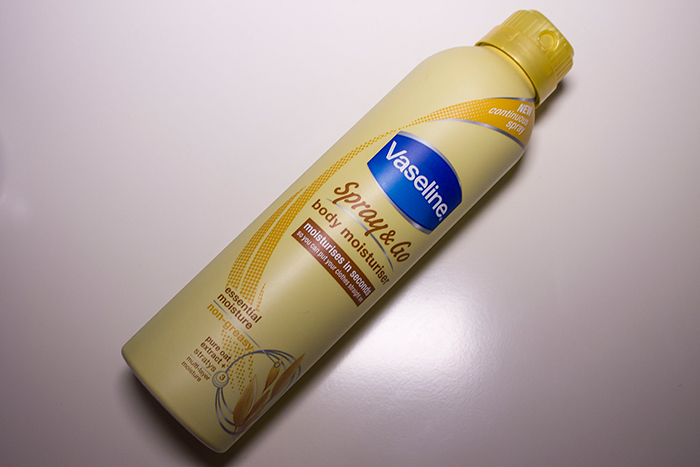 Recently there's been a few products come out to solve this problem like in shower moisturisers but the latest one I've been trying is the Vaseline Spray & Go Body Moisturiser. There's three kinds of Spray & Go's to choose from including Cocoa Radiant, Aloe Fresh and Essential Moisture. As lovely as the other two scents sound, I decided to go for the Essential Moisture option because if I'm wearing perfume I don't want it to mix with the other scents so I felt that was the right choice for me. Essential Moisture comes in a heavy 190ml can which you click the top to open and spray away. The spray mechanism can be quite crucial to how well this applies but with the continuous spray, I think it applies perfectly. It sort of comes out in a mist which you spray over your body and rub into the skin so the process is very quick and easy. For a body moisturiser, the formula is very light so it doesn't take long at all for it to sink into the skin but I do wonder if it's giving my skin the same amount of moisture as I would get using a normal body moisturiser. But I suppose this is better than no moisturiser at all! I'm so impressed with this stuff and I'm sure my skin will be thanking me for it as it makes body moisturising a much more enjoyable process. If your skin needs a little extra moisture and you hate the normal process, I highly recommend you pick one of these up.